I got my first taste of live rugby about a week ago thanks to a work buddy with extra tickets. 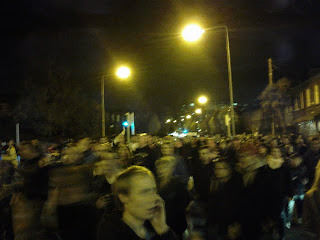 It was a last minute decision to go to the popular Leinster v. Munster match but we're glad we did. The approach to Aviva Stadium was simply thronging with people. We arrived at our seats just a few minutes before the pre-game drummers took to the field to welcome The Boys in Blue (Dublin favorites - Leinster). SIDEWALK SAFARI SPOTLIGHT: It is well-worth spending some time in Dublin. Check out our huge list of one day Dublin City itineraries to keep you busy. We were really close to the action and the sell-out crowd was energized. I usually take for granted that I know a lot about sports (eg: American football and hockey). I was able to get the gist of what was going on at the match but wasn't sure what to shout out when different things happened. For example, it sounds like 'out of bounds' is called a 'lineout' in rugby. I liked how the teams do a carefully orchestrated acrobatic maneuver and lift players in the air to catch the ball at it soars back into play. I also loved how people waved their Leinster flags whenever the team scored. In this game, scoring was mostly due to penalty kicks. There was only one 'try' (like a touchdown in American football). 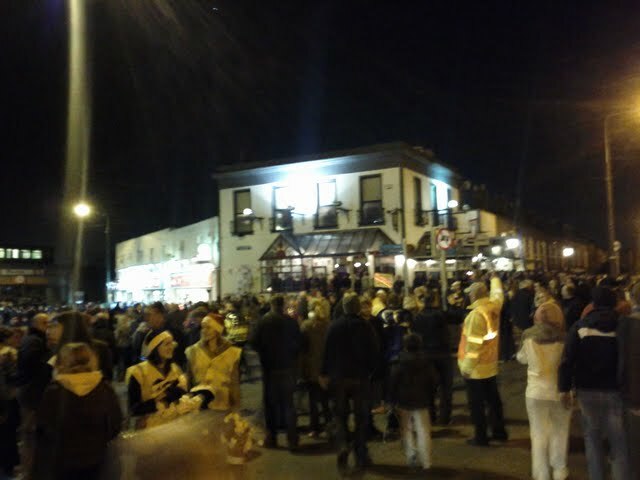 That was scored by Munster so the majority of the crowd wasn't too thrilled by it. There were a couple of odd sights at the match that I wasn't sure what to make of. The extra players ran around the outside of the field in bright yellow safety jackets doing drills and such which the game continued at the far end. The poor camera guys, medical staff, and others on the sideline had to stay low to the ground so as not to impede the audience's view. 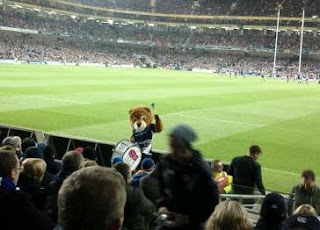 The Leinster mascot, a drum toting lion banged away and riled up the crowd. The crowd would burst into song periodically to sing 'Come on You Boys in Blue'. It was during the song that I realized just how one sided the crowd was gender-wise. The singing was definitely very low pitched. I looked about and realized that there were probably only 10% women in the vicinity. Seems like rugby is a bit more popular with the fellas -- at least for the live matches. At the end of the game, a crowd of security lined the field to make sure the victorious Leinster fans didn't run down onto the field. What was the best part of the match? 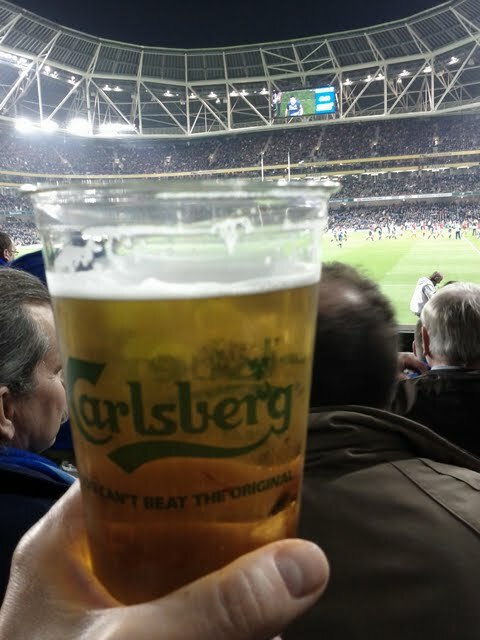 The fact that Aviva Stadium doesn't gouge on beer. In American stadiums, a beer can cost more than twice was it would cost at a local pub. Here, it was maybe 50 cents to a euro more. Kudos for keeping prices under control!